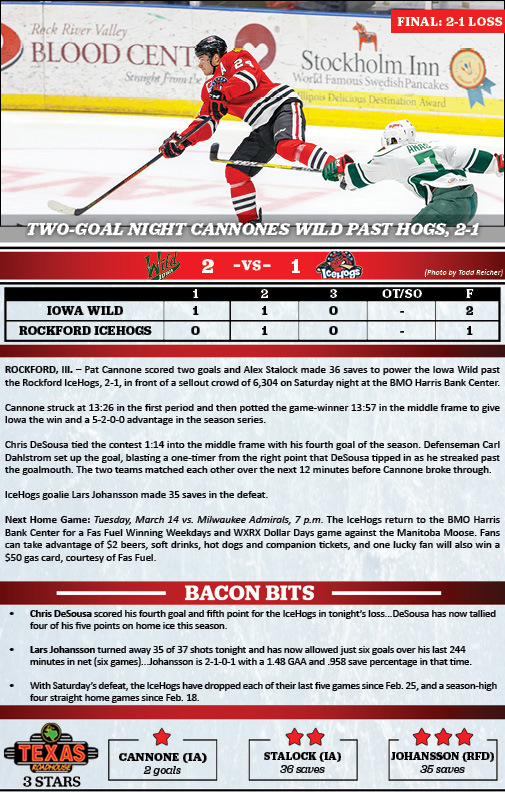 ROCKFORD, Ill. – Pat Cannone scored two goals and Alex Stalock made 36 saves to power the Iowa Wild past the Rockford IceHogs, 2-1, in front of a sellout crowd of 6,304 on Saturday night at the BMO Harris Bank Center. Cannone struck at 13:26 in the first period and then potted the game-winner 13:57 in the middle frame to give Iowa the win and a 5-2-0-0 advantage in the season series. Chris DeSousa tied the contest 1:14 into the middle frame with his fourth goal of the season. Defenseman Carl Dahlstrom set up the goal, blasting a one-timer from the right point that DeSousa tipped in as he streaked past the goalmouth. The two teams matched each other over the next 12 minutes before Cannone broke through. IceHogs goalie Lars Johansson made 35 saves in the defeat.